Head of Samaria Regional Council convinced that ramming near Havat Gilad was a terrorist attack. 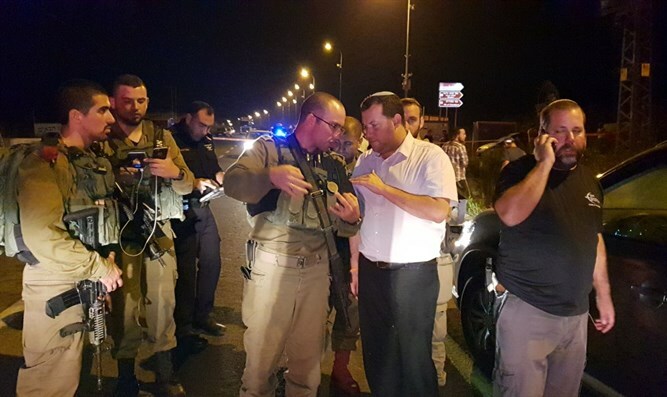 The head of the Samaria Regional Council, Yossi Dagan, arrived on Thursday evening at the scene of the car ramming incident near Havat Gilad, saying he is convinced that the incident was a terrorist attack, despite the fact that the Palestinian Arab driver turned himself in. "From the point of view of the commanders in the field, as well as from our point of view, this is a terrorist attack for all intents and purposes. The junction is a lighted junction with light poles placed by the National Roads Company of Israel. There are no signs of the screeching of the breaks or that the car stopped, neither before nor after the scene of the attack," Dagan said. "The driver was not surprised by the accident. As far as we’re concerned, this is yet another serious murder of a resident of Samaria on a central road in the State of Israel,” he continued. Thursday’s incident occurred when a woman in her 40s was run over by a Palestinian Arab vehicle near Havat Gilad in Samaria. The driver fled and an hour later turned himself in to the Palestinian Authority security services. The driver claimed the incident was an accident. The incident took place on Highway 60, not far from where Rabbi Raziel Shevach was murdered in a shooting attack last January.